One of my favourite things to do in Montreal is to walk or run on the Lachine Canal from the Old Port of Montreal to Atwater Market. Once there I buy my coffee and take a few moments to watch all the people – tourists, locals, all coming together from different parts of the city to congregate at the market. I usually end my trip by doing a little grocery shopping myself. I almost always end up spending more than I would elsewhere, but it’s fresh and, in most cases, local. 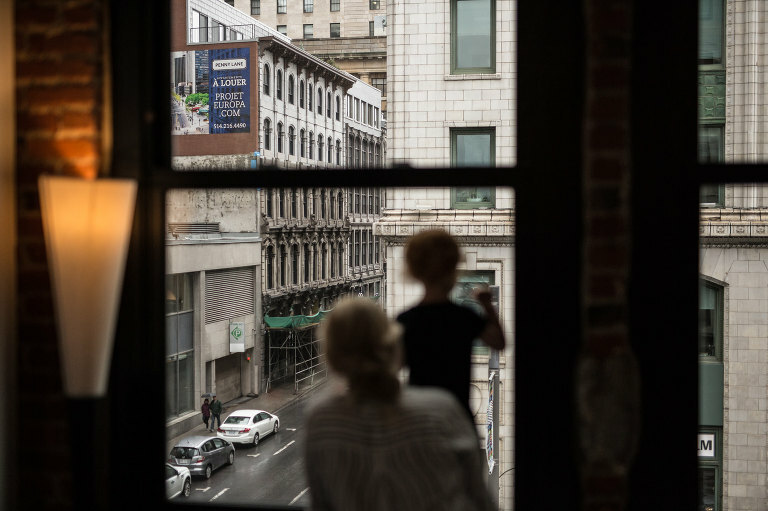 When I suggested to Brittany and Alain that we meet at Atwater market for our first get together, I was happy to hear that they shared my love of the place. One of their favourite things to do is make a trip to Atwater market on Sundays – pretty much doing the same thing I do! We’d probably crossed paths a ton of times before we ever officially met. We met up, grabbed a coffee, and went for a walk. Meeting a couple for the first time often feels strangely reminiscent of a date. I always feel myself getting a little nervous. Will they like me? Will I like them? It feels like pulling petals off a daisy one by one…they love me, they love me not. The good news is that the “date” went well. It was a good match. So let’s get to the good stuff. The wedding! When they told me that they were planning to have a small and intimate eighty person affair at a restaurant, I was super excited. I love all variety of weddings. Small. Medium. Large. (Sometimes super large, but not as much.) They each have something special to offer – the intimacy, the energy, the crush of loving family and friends. The most important thing is that there is love. Real love. That said, I love restaurant weddings, no matter how big. Especially when the restaurant is like Jatoba. From the incredible ambience to the service and the mouthwatering dishes they serve. This place was perfect. Another key element of Brittany and Alain’s day was, surprisingly, rain! We ended up doing family portraits as well as some other shots in a random hallway leading to the metro. We just rolled with it and it turned out so well. I couldn’t have planned it better if I’d tried. First look? Hein? What the? First what? The bride and groom had decided to do a first look – for those who don’t know, this is when the couple sees each other for the first time before the ceremony and takes pictures then too. People seem to be split on whether they like this trend, but one benefit is that it allowed us to take all the family pictures as well as some other formal pictures before the ceremony even began. 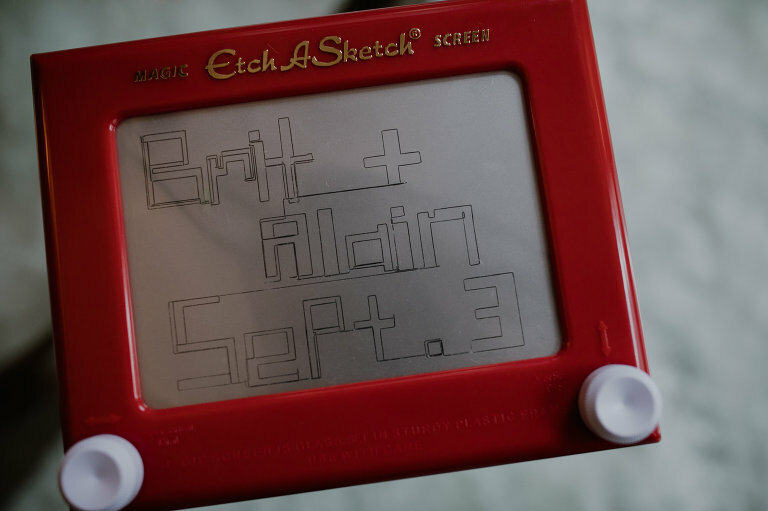 This allowed Brittany and Alain to enjoy the rest of their day without leaving their guests to do pictures. It also allows me to shoot in a super candid style. Ultimately, it’s all up to preference – you do you! Waiting to walk down the aisle is a pivotal moment for many people, one that can be really incredible to organize the day around. When I get married, I do hope that it’ll be possible to do a first look though. It becomes a very intimate moment between a couple on a day where they’ll otherwise be surrounded by others. My favourite part of this wedding day was how spontaneous we could be. The schedule was very open to changes. I saw Brit and Alain talk with pretty much every guest, sometimes two or three times. We even got a chance to run across the street for some extra shots at one point. That’s when I got one of my favourite shots of all time. A picture I almost didn’t take as I was also crossing the street. I’m so happy I put the camera to my face and snapped. Please make sure to check out the list of vendors at the end of this post. Let me know what type of wedding you like best in the comments. Are you a first look kind of person…or a traditional wait til the ceremony kind of person? Small wedding? Big wedding? Elopement? Orchids – Cosmic Plants Inc.